The extended Detroit area has a wide range of hotel accommodations to suite every need. The Atheneum Suite Hotel delivers elegance, comfort and unique style, earning it the status of one of Detroit's premiere hotels. This luxurious, all-suite hotel is situated in the heart of the charming Greektown dining and entertainment district. The Atheneum is adjacent to Greektown Casino, and restaurants, nightclubs and shops abound. Your room is only a short walk (or hotel shuttle ride) from the home of the Detroit Tigers, Detroit Lions, Detroit Red Wings and Detroit's growing Theater District. The Crowne Plaza Pontchartrain Detroit is located in the heart of the Detroit downtown business district, adjacent to Cobo Center. It offers a comfortable and contemporay design to meet your needs. Free Wi-Fi internet and a 24-hour Business Center provide all the space & tools you need for a worry- free business trip. We are known as ''The Place to Meet" and we offer the best hotel location in downtown Detroit. Some of our outstanding amenities include Concierge Service, State-of-the-art fitness center, indoor pool, and valet parking. No matter what brings you to Detroit, you will enjoy the spectacular view of the Detroit River and Windsor Skyline from The Top of the Pontch. The Courtyard by Marriott Detroit Downtown features one of the largest guest rooms in downtown Detroit and offers complimentary high-speed wireless Internet, 37-inch flat panel TVs, and connectivity panels in each room. The People Mover connects the hotel to COBO Center and other local attractions including Joe Louis Arena, Ford Field, Comerica Park, Greektown Casino, all which are within one half-mile of the property. Detroit Marriott at the Renaissance Center is situated just blocks from COBO Center, and connected to it by the People Mover, along with the Joe Louis Arena and Greektown Casino. The hotel is located inside the GM Renaissance Center, which provides convenient access to shops, restaurants and entertainment. It is also adjacent to the newly revitalized Riverwalk, with jogging paths, bike rental facilities, carousels, fountains and festivals. The hotel features floor-to-ceiling windows with dramatic views of Canada and the downtown skyline. DoubleTree Suites by Hilton Detroit Downtown Fort Shelby hotel is one of downtown Detroit's newest hotels, reopening after a $90 million restoration of the Historic Pick-Fort Shelby Hotel. The hotel is located 25 minutes from Detroit Metropolitan Wayne County Airport (DTW) and just three blocks off the M10 / Lodge Freeway, this historic downtown hotel sits blocks from the Cobo Center meeting and convention center, Joe Louis Arena, the Theodore Levin U.S. Court House, the McNamara Federal Building, and Detroit's business and financial district. It is the closest hotel to the convention center. Introducing Detroit's sharpest new hotel! The architecturally stunning, 30-story hotel visibly changes the skyline of Detroit, displaying luminescent blue glass windows offering views of the Detroit River and Canada. 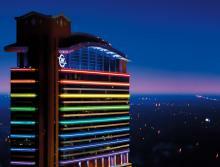 The Greektown Casino - Hotel is located right in the heart of Detroit's action. It's just a short walk to Comerica Park, home of the Detroit Tigers; Ford Field, home of the Detroit Lions; Music Hall; the Fox Theatre entertainment district, and so much more! The new Hilton Garden Inn Detroit hotel is in a prime downtown location just 1 block from Comerica Park - Ford Field - Michigan Opera House - Greektown Casino And Fox Theatre. Compuware - General Motors - and the UAW Training Center are among the corporate offices located nearby. - Friendly service and a relaxed atmosphere await guests. Guests will have no problem filling their leisure time whether they enjoy casino gambling - the opera - or sporting events. The hotel is near to the Detroit Athletic Club - GEM Theatre and Music Hall - Cobo Center as well as Comerica Park and Ford Field. Everything right where you need it. The Holiday Inn Express Suites Downtown is located near Detroit City Airport ( DTT). The hotel is in the heart of downtown Detroit and is within walking distance of Cobo Convention Center, Joe Louis Arena (Detroit Red Wings) and the new MGM Grand Casino. The hotel is positioned perfectly near the People Mover, Greektown Casino, Motor City Casino, Detroit Opera House, Fox Theatre, Hard Rock Cafe, Comerica Park (Detroit Tigers), Ford Field (Detroit Lions). The world's finest elements have converged to deliver the ultimate entertainment experience: MGM Grand Detroit in the heart of downtown. From lavish event space, luxurious accommodations and exquisite dining to dynamic gaming and the hottest nightlife in the land, MGM Grand Detroit is redefining cool. The Roberts Riverwalk Hotel & Residence Detroit is gracefully tucked in the turn of the century Stroh River Place and overlooks both the Detroit River and Canadian coastline. Convenient to Detroit’s entertainment attractions, Roberts Riverwalk offers guests a blend of privacy in an estate-like setting and boasts elegant, traditional guestrooms that maintain the sophisticated historic character of the City of Detroit. Transportation to Cobo Center and downtown Detroit is provided to guests. Newly refurbished and newly discovered, Trumbull & Porter has undergone a major renovation touching all aspects of the hotel including 144 guest rooms, drinks and dining, a spacious fitness center and an outdoor courtyard that has become the place in Detroit to see and be seen. Modern amenities are thoughtfully appointed, as guests enjoy designer rooms with custom furniture built by Michigan artisans. 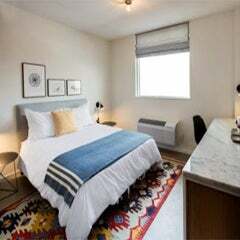 Located in the revived Corktown neighborhood, the hotel features the award-winning Red Dunn Kitchen. Trumbull and Porter proudly supports marriage equality for all couples. Upon completion of a massive $180 million renovation, the historic Book Cadillac Hotel has been restored and rejuvenated to its original splendor and become The Westin Book Cadillac Detroit, reclaiming its position as Detroit's premier lodging and social gathering destination. A member of the National Registry of Historic Buildings, the Italian-Renaissance-style hotel, originally built in 1924 by the Book brothers, is conveniently located in the heart of downtown Detroit.